Original photo by paul goyette and shared under the Attribution-ShareAlike 2.0 license. Following Web2Expo/Open, a number of us got together for a Microformats dinner at Thirsty Bear. Some concern was raised over the increasing influx of proposals for new microformats — instead of sustained work on existing formats or techniques. In discussing this, we realized a few things. Chief among them is that, as a community, we’ve been spending a great deal of time and effort providing a rationale and explanation for why microformats are important and how we use a community-driven process to derive new microformats. Now, there are historic reasons why our process is different and why we continually refer new members to it. If you consider that web standards themselves are created, reviewed and ratified by the W3C, a consortium of paying members bound to very specific rules and mandates, you’ll realize that the value of our community’s output is measurable by the degree to which we are able to consistently produce high quality, clear and implementable specifications. Without adherence to recognized process, chaos would unfold and we’d end up with a myriad of inconsistent and overlapping formats, which is what essentially killed the Structured Blogging initiative. In the microformats community, it’s existing behavior discovered through research and prior standards work that most often leads to new formats, and this work is often undertaken and championed by independent individuals, as opposed to corporations. On top of that, our self-imposed mandate is to stay specific, focused and relevant, optimizing for the 80% use cases and ignoring the 20% edge cases. This story has been replayed and retold the world over, with great effect and consequence. What we have failed to articulate in the same time and space, however, is what work is necessary beyond the creation of new microformats. And because of that, we have more so many folks joining the community, eager to help, and seeing only the opportunity to — what else? — create a new microformat (in spite of the warning to not do so!)! So, the ultimate result of the conversation that night was to focus on a rebranding of an old idea along with a new process for generally getting involved in the microformats movement with a subset of tasks focused exclusively on advancing POSH. 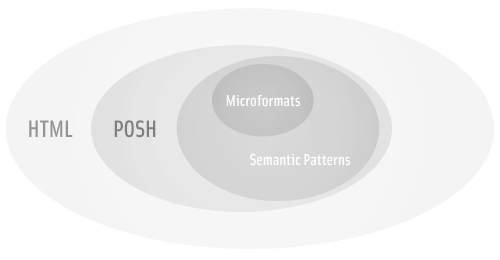 From now on, we will now be promoting POSH (as coined by kwijibo in IRC) as a first order priority, alongside the development and improvement of existing microformats. Publish: if you’re not already, add valid, semantic markup to your own website. It goes without saying that you should also be publishing microformats wherever it makes sense. Focus on improving the web as it is and that you have access to. Spread: advocate for and encourage others to follow your lead in implementing valid POSH and microformats. Familiarize yourself with web standards, accessibility, and why POSH is important. Do presentations on POSH at BarCamps and elsewhere; write about it, share it with friends, hold POSH Pits to create and build things with POSH. Add buttons (coming soon) to your site once you’ve been POSHified! Use: consume microformats — and better yet — add live subscriptions to data marked up in existing formats. With all the microformats implementations in the wild, we need to start seeing some really innovative and time-saving uses of microformats, including tools for easily embedding microformatted content into blog posts and elsewhere. OpenID: meanwhile, consider adding OpenID identity services to your application or service — and support hcard and XFN data syncing. Improve: once you’ve gone through and added POSH to all your websites, go back and refactor, iterate and provide feedback, tips and learnings about what you did, how you did it and why you did things the way you did to the greater community. Tag your posts with ‘POSH’, contribute them to the wiki and generally seek out opportunities for improving the resources available to the wider audience of web designers and programmers. In the coming days, we’ll be adding more documentation to the wiki and encouraging others to spread the word (as you should!). Lastly, to help frame the POSH concept, think of of it as a “Fast-tracked Microformats Process” — wherein you can do your research, develop semantic patterns and then implement them without going through the same drawn out process that accepted formats must go through… because the goal is actually not to develop a new format, but to solve a specific and time-sensitive problem. Over time, these implementations will come to represent the body of prior art necessary to make informed decisions about future formats, but the immediate goal is to simply POSHify the web and not attempt the development of yet another format. Good summary + call to action. Thought you might consider changing the process of contribution to PUSH. Have been looking at ‘microformating’ my blog since seeing a presentation by Glenn Jones, this is yet another reason to do so. Looks like I’m going to have to learn how to wrangle WordPress better… and go some buy some new books. Neil, if you start with themes like K2 and Sandbox, most of the work is done for you already. There are also widgets (like the hCard About widget) that are also useful. You don’t necessarily need to get into the code in order to add semantics — sometimes it’s just using the tools that are already available! Chris, thank you for the advice and the pointers. Am off to investigate now. I am one of the people guilty of immediately imagining a thousand new microformats upon becoming interested in the idea. Although, I’ve also been really interested in the deployment of existing microformats, particularly in wiki. The idea of having a POSH layer of development connected in this way really helps me think about how to solve the different problems I’ve been brainstorming, without cluttering microformats communities. So, thanks for working this out. Please do not call it POSH. POSH is a terrible name for it. This is Web 2.0 cutesy naming at its worst. I’m excited about microformats, but this word is making me ill.